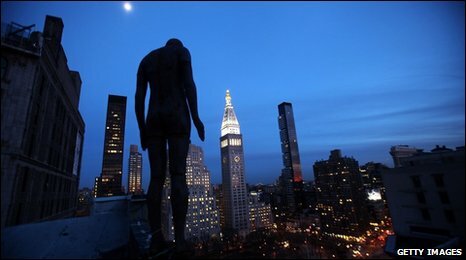 New York police have responded to 10 calls from residents fearing that life-size figures gazing down from buildings are real people about to jump. British sculptor Antony Gormley has placed 31 figures of himself cast in iron and glass fibre on city pathways, pavements, rooftops and ledges. The Event Horizon installation opened last month with the city's blessing. A student jumped to his death from one of the sites used - the Empire State Building - just after it opened. New York's police department had alerted the public to the installation even before it opened, on 26 March, so they would know the figures were not real people in distress. However, they were still receiving anxious calls as recently as Wednesday. "It's a waste of manpower," one policeman told the New York Post newspaper. "We're short of cops to begin with and we don't have enough cops to waste answering calls of statues committing suicide." Gormley had a similar installation in London in 2007. Speaking about his New York project shortly before it opened, he told the New York Times: "If people think of death and suicide, it's a sad reflection on evolution. "This is meant to be an amazing celebration of New York." The man who killed himself was a Yale University student. He jumped from the Empire State Building on 30 March.